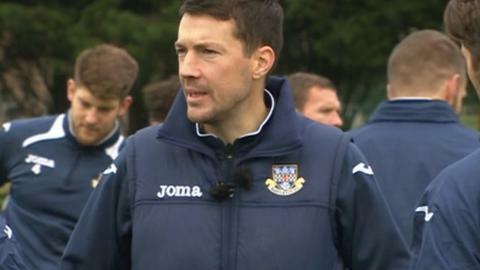 Eastleigh manager Chris Todd is pushing his squad to go as far as possible in all competitions. The National League club are the only non-league side left in the FA Cup third round and face Bolton at home in the new year. The Spitfires are also pushing for promotion in the league and targeting a run in the FA Trophy. "I want to go 100% in all three competitions and set a winning mentality," Todd told BBC Radio Solent. "It's an amazing achievement to be the last non-league side left in the FA Cup, when you consider all the non-league sides who enter at the start of the competition. "It's great for the football club and it just keeps growing and growing." Fourth-placed Eastleigh face bottom of the table Kidderminster on Saturday and have been drawn at home against Gateshead in the FA Trophy second round. "I want to set a winning mentality in the football club, regardless of what competition it is," Todd added. "We go into games trying to win. But, I want to reiterate that we do that day-in, day-out whether it's in five-a-side training games or in matches on Saturdays."